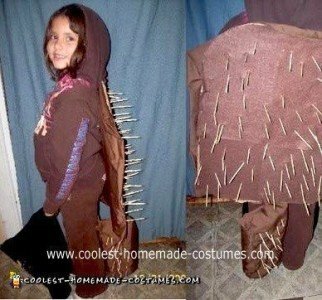 When my daughter asked me if she could be a porcupine this year I was baffled on how to make a Homemade Prickly Porcupine Costume. I came to your site and not one was here. So I was on my own. I used cardboard for the back and stuck skewers through it. Then when the skewers were through it I hot glued the end that was on the cardboard so they stayed better. Then I covered that part with fabric so my daughter couldn’t feel the hardened glue. Then I just tied some twine on it and attached it. She wanted a tail but I wanted it thick so you could tell it was a tail so I used some egg crate material. (foamy stuff for beds.) covered it with some brown material and stuck skewers through that and safety pinned it to the bottom of the back. Alesia wore an all brown outfit and that’s it. I got a lot of compliments on it but you need to be careful it’s very prickly.